Yvonne Toll is one of Atlanta’s premier trumpet performers and instructors. She has been in high demand as a free-lance musician since moving to the area in1988. She received her undergraduate degree from North Park College in Chicago and her Masters of Music from the Eastman School of Music, where she was awarded the prestigious Performers Certificate. Ms. Toll joined the Atlanta Opera in 1996 and was appointed Principal Trumpet in 1997. She can be heard several times a year performing with the Atlanta Symphony and the Atlanta Ballet as an extra musician. As well as performing symphonic and solo work, Ms. Toll might be seen in the orchestra pit for various Broadway Shows or Musicals performed in the Atlanta area. In addition to her performing schedule, Ms. Toll maintains a teaching studio of students ranging in age from 8 to 83. She is currently Instructor of Trumpet at Clayton State University. While living in the Atlanta area, she has taught trumpet as a part-time or visiting instructor at Georgia State University, Columbus State University, Agnes Scott College, Georgia Perimeter College, and Emory University. Her students have achieved full time music careers as middle and high school band directors, free-lancers, business owners, managers, and recording engineers. Ms. Toll is currently training for an Ironman race (swim 2.4 miles, bike 112, run 26.2) taking place in Chattanooga September of 2015, and is raising money for the Leukemia & Lymphoma Society through Team in Training. Virginia native and New York City/Chicago trained classical trumpeter Stuart Stephenson began playing trumpet at age ten, after starting piano at age six. He spent his childhood in Northern Virginia, where he studied with members of the United States military bands and the National Symphony. From there he went to NYC and completed his undergraduate degree at The Juilliard School. During his time at Juilliard, Stuart was a member of the Vandalay Brass Quintet, which performed at the Bachauer Scholarship event for two years in a row live on New York's 96.3 WQXR-FM. The quintet was an active participant in the Young People’s Concert Series, sponsored by the Juilliard Office of Educational Outreach. His quintet has played throughout New York City, including philanthropic events at hospitals, hospices and rehabilitation centers, and even the United Nations Building. The quintet members studied privately with musicians of the New York Philharmonic, Metropolitan Opera, American Brass Quintet and New York City Ballet, with frequent chamber coachings by members of the American Brass Quintet. Stuart performed regularly with The Juilliard Orchestra in New York City at Carnegie Hall, Avery Fischer Hall and the Peter Jay Sharp Theater. Stuart then went on to study at Northwestern University with Professor Barbara Butler, Charlie Geyer and Chicago Symphony principal trumpet Chris Martin, where he earned his Masters of Music degree. His instructors in the Washington, D.C. area include Adel Sanchez (NSO), Tom Cupples (NSO) and Jim Bittner (USAF Band). Stuart has spent summers at the Aspen Music Festival in Aspen, Colorado, the Schleswig-Holstein Musik Festival in Germany, the Tanglewood Music Center and was invited most recently to play with the Grand Tetons Music Festival in Jackson, Wyoming. Stuart joined the Atlanta Symphony in the spring of 2013, immediately following his graduation from Northwestern University. Jay serves as Adjunct Professor of Horn at Mercer University School of Music in Macon, GA. Jay received a Bachelor of Music Education degree from Florida State University in 1981. He received his Master of Music in Performance at Georgia State University in 2004. While attending school there he was the winner of the Thomas M. Brumby Concerto/Aria Competition and the 2004 Honors Recital Competition. After graduation, he opened Jay's Horn Studio, comprised of private students from all around the Atlanta area. Jay conducts horn and brass clinics at schools all around the state of Georgia. He is currently Principle Horn with the Columbus Ballet, Gwinnett Ballet Theater Company, John’s Creek Symphony, LaGrange Symphony, Capital City Opera, Atlanta Lyric Opera, and the New Atlanta Philharmonic. He also performs with the Columbus Symphony, Gainesville Symphony, Carroll Symphony, and the Ludwig Orchestra. He has performed for Edwin McCain with the Atlanta Symphony Orchestra. Jay has recorded with the Rock Band “Cartel”, with R&B Grammy Award Winner Jennifer Holliday, and performed live with Barry Manilow. Amy King Black is active as a free-lance musician in the Atlanta area and has performed with groups such as the Greenville Symphony Orchestra, Atlanta Symphony Orchestra, Columbus Symphony Orchestra, Atlanta Lyric Theatre, the Ray Charles Orchestra, Carroll Symphony Orchestra, and Atlanta Ballet Orchestra. She has also played for numerous conferences and festivals, including Piccolo Spoleto in Charleston, South Carolina, College Band Directors National Association Conference, and Georgia American Choral Directors Association Summer Workshop. Concert tours have included trips to Italy, Germany, and the Czech Republic, as well as many US cities. Mrs. Black teaches music appreciation, music theory, and music history courses at Clayton State University and is the Artist Affiliate in Horn at Agnes Scott College. In addition, she maintains a studio of twenty private horn students and frequently conducts clinics and master classes for high school and middle school students throughout the region. She received a Bachelor of Music degree from Samford University and a Master of Music degree from the University of Georgia. Her primary teachers have included Kevin Kozak, Brice Andrus, Jean Martin-Williams, and Fred Mills (brass quintet). Marc Boehm earned his Bachelor of Music degree in Trombone Performance from The Juilliard School in New York City. While at Juilliard, Marc studied with Joseph Alessi, principal trombonist of the New York Philharmonic. During his undergraduate studies, Marc held a position with the orchestra Symphony in C, one of only a few professional training orchestras in the US. Marc also maintained an active freelance schedule, often performing with orchestras in Carnegie Hall and Avery Fisher Hall in New York City. After graduating, Marc went on to study at Manhattan School of Music under the direction of Dr. Per Brevig, former principal trombonist of the Metropolitan Opera Orchestra. Marc earned his Master of Music degree and also earned special distinction as an Outreach Graduation Award recipient for his work teaching trombone in New York City’s public school system. During his time in GA, Marc has performed with the Atlanta Symphony Orchestra, Atlanta Opera, Atlanta Ballet, Columbus Symphony Orchestra, Macon Symphony Orchestra, LaGrange Symphony Orchestra, Albany Symphony Orchestra, Gwinnett Ballet Theatre Company, Gainesville Theatre Alliance, Georgia Brass Band, among others. Marc maintains an active freelance schedule and also teaches privately. 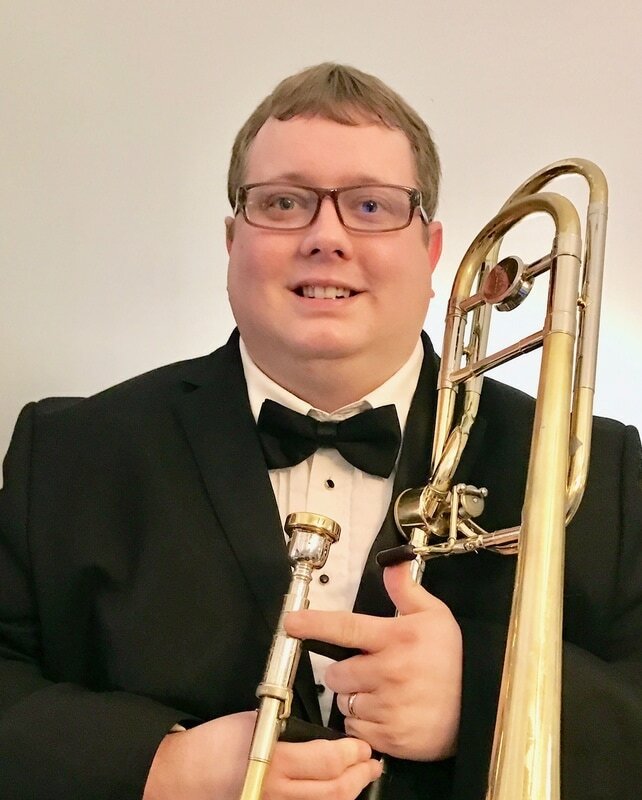 Marc is currently an Adjunct Instructor of Music at Young Harris College where he teaches trombone, music appreciation, and is the director of the Brass Ensemble. Marc is also an Artist Affiliate at Emory University where he teaches trombone and coaches winds/brass sectionals. In addition to his collegiate work, Marc is also the Trombone Teaching Artist with the Atlanta Music Project, and is in high demand as a clinician, sectional coach, and private teacher in middle and high schools all over metro-Atlanta. Many of his students perform in GMEA's All-State Bands and Orchestras. Marc can also be heard on the “From the Top” Radio Show (2003), Live from Lincoln Center Broadcasts with the Juilliard Orchestra on PBS, as well as on Joseph Alessi’s album, Return to Sorrento, which features the Juilliard Trombone Choir. ​Bernard H. Flythe is the newly appointed tuba and euphonium professor at Columbus State University and will begin his tenure this fall. Prior to his appointment at CSU, Mr. Flythe served for 10 years on the faculty at Kennesaw State University and for four years on the artist-faculty at the Sewanee Summer Music Festival. He also held faculty positions at Appalachian State University, Austin Peay State University, Emory University, the University of Georgia, the University of Toledo, the University of North Carolina at Chapel Hill, the University of Michigan All State Program at Interlochen, the University of Michigan Summer Arts Institute, and the UNC-Greensboro Summer Music Camp. As an orchestral tubist, Mr. Flythe has performed with the Detroit Symphony Orchestra, the Atlanta Symphony Orchestra, and the Nashville Symphony. During the 1992-1993 season, he served as the acting principal tubist with the North Carolina Symphony. As a chamber musician, Mr. Flythe has performed with the Detroit Chamber Winds, the Atlanta Symphony Orchestra Brass Quintet, and the North Carolina Symphony Brass Quintet. Mr. Flythe received a bachelor of music degree from the University of North Carolina at Greensboro. He earned his master of music and his specialist in music degrees from the University of Michigan. Mr. Flythe's principal tuba teachers include Fritz Kaenzig, Robert Leblanc, David Lewis, Wesley Jacobs, and Micheal Sanders. *Artist-faculty are subject to change.